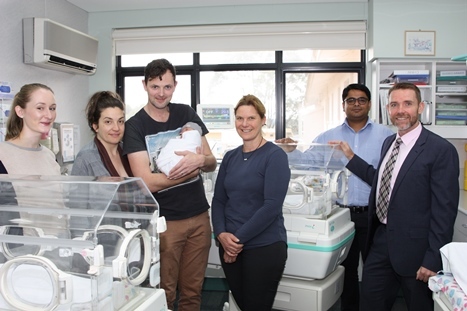 Midwife Jessica Hogan with Shannon and Damien Kearney and baby Agnes, Midwife Sara Moyle, Surgical Unit Manager Vinu Sebastian and Chief Executive, Rohan Fitzgerald. Two new infant incubators have arrived at Western District Health Service (WDHS) thanks to a generous donation from the Collier Charitable Fund. The incubators were purchased for the Hamilton Base Hospital Midwifery Unit and are valued at over $52,000. Acting Surgical Unit Manager, Vinu Sebastian says the new ATOM touchscreen incubators feature the latest technology to care for sick and premature babies. “Incubators are used for the ongoing observation and monitoring of newborns and in the stabilisation process prior to transfer of an unwell baby. The incubators are temperature controlled, providing a warm, enclosed environment for baby and also allow for heart rate and oxygen monitoring. They promote developmental care and feature a phototherapy light and blanket to treat jaundice. We are so grateful to receive this donation from the Collier Fund, to update our equipment to the best and most baby-friendly options available,” Mr Sebastian said. The Collier Charitable Fund has contributed over $480,000 to WDHS for medical equipment purchases and redevelopment works over many years. Established in 1954 by three Melbourne sisters, Alice, Edith and Annette Collier, the total grants made from the Fund to date exceeds $97 million. WDHS Chief Executive, Rohan Fitzgerald says the Fund has been a tremendous supporter of WDHS. “The Collier Fund has supported equipment upgrades in almost every clinical area of our Health Service, from Theatre and Midwifery, to our ICU and Medical Units. The new incubators will assist WDHS to continue to deliver the safest possible care for babies ‘born in Hamilton’. We are extremely grateful for the Fund’s continued and generous support of our Health Service,” Mr Fitzgerald said.